The Black Forest (German: Schwarzwald) is a wooded mountain range in Baden-Württemberg, southwestern Germany. It is bordered by the Rhine valley to the west and south. It is not only one of the most varied, but also one of the biggest and best known holiday regions in Germany. There are many old towns in the Black Forest. 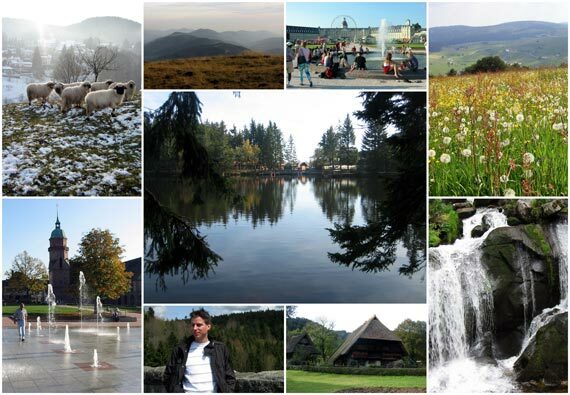 Popular destinations include mountains like the Feldberg, the Belchen, the Kandel, and the Schauinsland. The highest peak is the Feldberg with 1,493 meters (4,898 ft) above sea level. Other attractions include lakes like the Titisee and Schluchsee and waterfalls like the All Saints Waterfalls and the Triberg Waterfalls. Thermal baths like Baden-Baden, Badenweiler and Bad Wildbad have a long and rich tradition. Nowhere else in Germany you will find as many springs in such close proximity. The location, at the border of Germany, Switzerland and France places guests within easy reach of diverse cultures and varied landscapes.